Just a quick recap of the amazing Knit Dizzney 2017 Limited-Edition Swag! The official Knit Dizzney 2017 t-shirts are a light-weight soft 50/50 cotton poly blend. Sizing and pricing charts as well as pre-order forms for the T-shirts can be found here. The deadline for t-shirt pre-orders is 8/10/17. So don’t delay, order yours today! 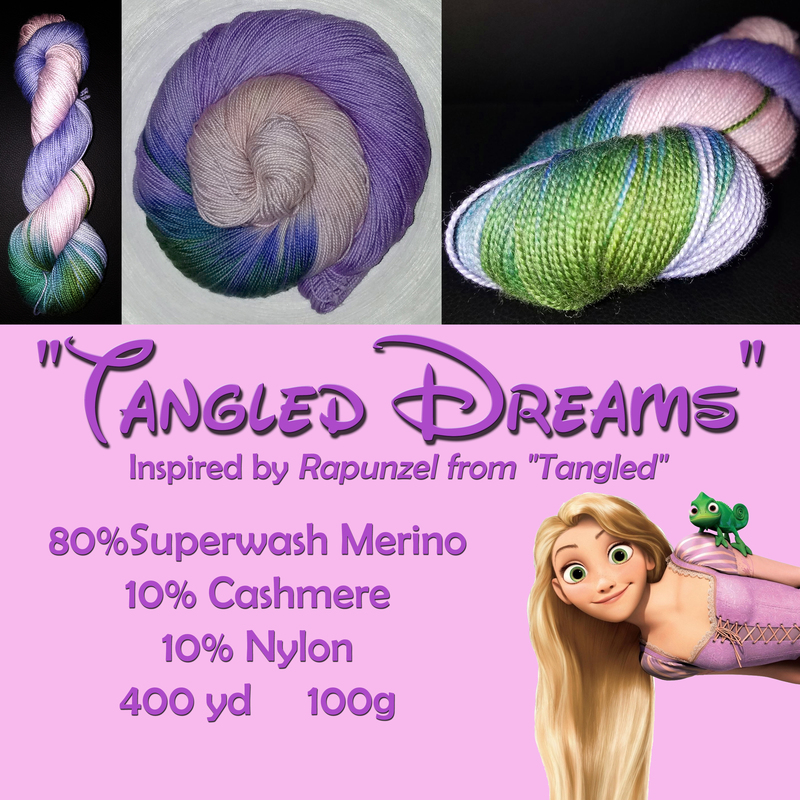 “Tangled Dreams” from Dizzy Blonde Studios is a wonderfully luxurious sock yarn inspired by Rapunzel and her ever-present BFF, Pascal (the chameleon who oddly never changes color). Additional details and pricing information can be found here, in the original post. If interested in the yarn only, it can be purchased separately here. Otherwise you can use the pre-order forms. The Panhandle Project Satchel is the perfect size for a crafter on the go, and has many clever features: A “Pan” handle to loop over the wrist, a locking toggle to keep the bag opening exactly where you want it, and several convenient pockets including her signature “needle niche”. If you don’t want to miss out on your Panhandle Project Satchel, order early using the pre-order form linked at the end of the post. And finally, something completely new! A second colorway. From now on, Knit Dizzney will offer 2 separate colorways based on the hero and villain of the chosen theme. “Sheep Knows Best”, from Lazer Sheep Yarns is a golden sparkly sock yarn and a bold contrast to “Tangled Dreams”, and is inspired by Mother Gothel, that deviously deceptive Grande Damme. 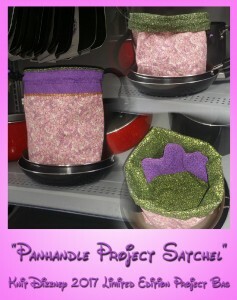 Use the pre-order form found in the “Tangled Treasures” post to order your yarn and project bags. Additionally, information on discounts for ordering bundle packages is in the same post. The deadline for pre-orders is August 21, 2017. 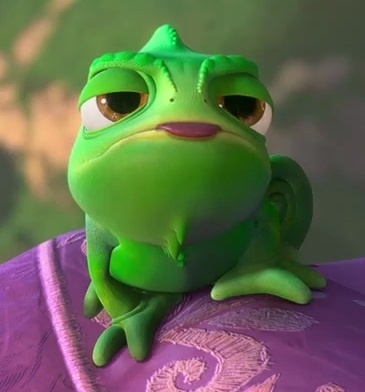 I left you a Facebook post and an email post regarding another way to pay instead of PayPal. Can you let me know before the bags are now thank you. The dark yarn received was not even close to photo advertised. I loved everything else.I especially liked the tangled yarn and the frying pan marker was perfect. Hi Cathleen. Thank you for the wonderful compliment about “Tangled Dreams” and its stitch marker. I had a blast coming up with the concept, and so thrilled when I found actual small frying pan charms online. Different screens show colors in photos differently. 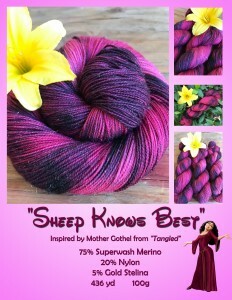 I know that the photo of the “Sheep” yarn looks a bit different on my phone screen than it does on my computer screen. The actual yarn is very close to the pictures as they are seen on my computer screen, but even more beautiful, with a slight variance between dyelots, as you would expect from hand-dyed yarn.